Graffiti removal and graffiti cleaning is becoming more necessary these days with America’s youth in the Cypress, TX area. Once graffiti is removed, it seems as though more graffiti goes right back up down the street. This is where Cypress Pressure Washing comes in. The best defense against a graffiti artist, is by making sure the graffiti is removed as fast as possible. If a graffiti artist knows the graffiti will be taken down right away, they will find a different area to leave their mark. Unfortunately, graffiti is a problem everywhere from major city areas such as Houston, to even the smallest towns like Cypress. As a result, this graffiti can often cause your property to look horrible in the eyes of potential customers, greatly affecting your business and home values. It can damage your image by creating an “unsafe” or “unsecured” feeling in the eyes of visitors to your facility, shopping center, business, or house. 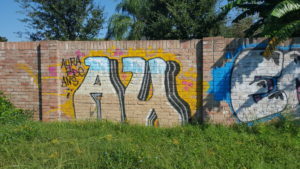 Gangs and crime are usually felt associated with most graffiti. This increases the hesitation that new potential customers will feel upon sight of a graffiti-tagged business or neighborhood. Which in turn, could drive away customers. Commercial Graffiti removal is needed more and more these days. The good news is, Cypress Pressure Washing can help restore graffiti tarnished areas to their original condition. We do this through specially designed, safe, and effective chemicals, and our professional-grade cleaning equipment. 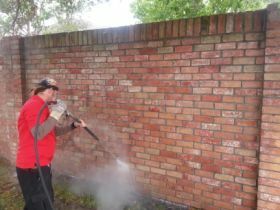 As a graffiti removal company, Cypress Pressure Washing has mastered the removal of this unwanted graffiti. We test all products available, new and old, to see what works best on different kind of surfaces, therefore we know what works best for the type of surface you need cleaned. 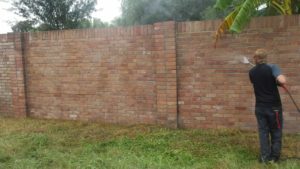 Cypress Pressure Washing can remove the graffiti using the safest, and most effective products available, therefore we remove it the first time. No matter what type of surface the graffiti is on, we have the right technique to remove it, because we are Cypress’ premiere graffiti removing company. Residential graffiti removal and commercial graffiti removal, we do it all. Contact us today to see how we can get rid of those unwanted graffiti tags on your property. Almost every chemical we use to remove the graffiti is biodegradable, and 100 percent green. As a result, we take pride in keeping our earth and communities safe. There are many chemicals you can buy at your local hardware store, but they just don’t have the power to remove these tough graffiti tags completely. Our chemicals are the most effective on graffiti. They remove the graffiti the first time, so your money isn’t wasted on a repeat visits by the other companies. Chemicals that we use to remove graffiti are claimed to be the best graffiti removers around. Most are preferred by almost all government facilities. Other chemicals are also used on a special need basis, depending on the special factors involved. Many times, no chemicals are needed to remove the graffiti. At times, using hot water pressure washing can completely remove the graffiti without chemicals, therefore keeping the costs down for our client. Once we do a free analysis on the graffiti you want removed, we can give you the options of how to best remove it. Call us today for your free analysis. Why Use Cypress Pressure Washing For Your Graffiti Removal Needs? 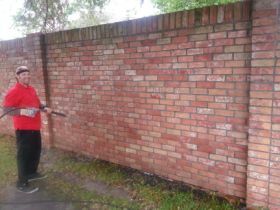 At Cypress Pressure Washing, we respond to graffiti reporting within 24 hours to remove the graffiti fast. This deters the vandals from putting more graffiti up in your area. If the vandals know that the graffiti will be removed immediately, they will start marking other areas. As a result, this will solve the problem faster than constantly removing the graffiti here and there. Our fast actions of removing graffiti will keep your property clean, therefore your property will always look amazing. Call us today for your free estimate. We remove graffiti for Home Owners Associations and Businesses with 100% success, because we remove it all the first time. We have yet to find a “tag” we can not remove. 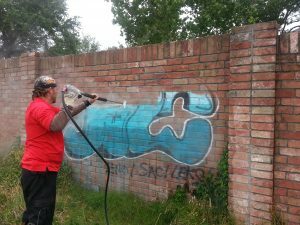 On many occasions, we have been called out to remove graffiti remnants left behind from other pressure washing companies, therefore you know we are the best company for removing your graffiti. If you have any questions, or would like a free estimate on graffiti removal, please feel free to contact us day or night. We offer 24 hour service to residential and commercial property owners and managers.